Proper repair of furniture is virtually a trade unto itself. 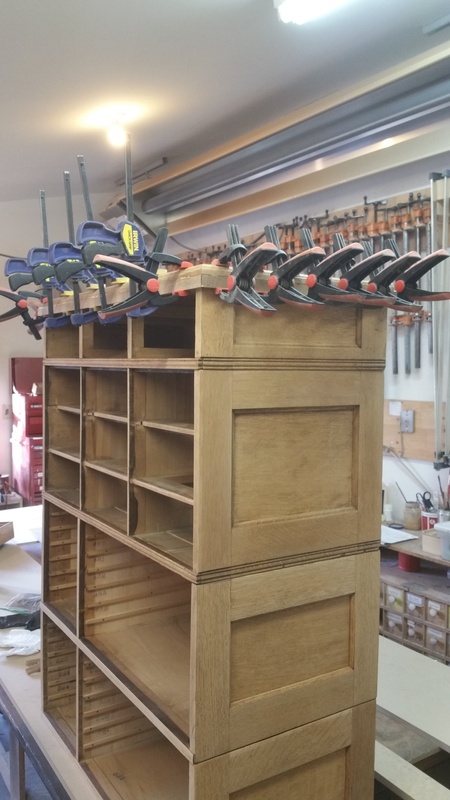 Of course most of the basic techniques that we learn in cabinetmaking apprenticeship apply, but there are countless specialized procedures and "tricks of the trade". Only extensive hands-on experience and the lessons passed on to us from our professional mentors can give us the skills to tackle ANY repair. We frequently are faced with the challenge of repairing a piece that was previously attempted by an amateur or a supposed professional. In many cases the wrong adhesives, or a poor fit of parts has resulted in a repair that won't last. It's much harder to properly repair once this has occurred. Please let us look at your damaged piece before you decide to tackle it yourself. Many damaged pieces not only require basic reglueing, but new parts must be reproduced to replace those that are too far gone. We have the ability to replace any part and make it fit seamlessly back into the whole, for both aesthetic purity and durability. Our refinishing process gets all the old finish off without damage to the wood fibres, nothing is dipped into a tank full of harsh stripper! Our talented craftspeople then laboriously prepare the surface with many stages of sanding and filling as needed to create the proper substrate to be stained to the correct colour. After that phase has dried we apply five durable coats of hand-rubbed clear top-coats for beauty and protection. Please click on the image above to take you to a gallery of examples of our work!